The package for this figure may say "Duke," but you really get the feeling that Hasbro only did that for name recognition - because if you're creating a line of budget-priced Joes for a chain of dollar stores, are you going to give them the guy whose name moms and grandmas might recognize, or the guy who will only be known by fanboys? Short-Fuze comes from military family; his father and grandfather were both career Top Sergeants. He enjoys abstract mathematics and can actually plot artillery azimuths and tribulations in his head. He's logical and sensitive, he has a tendency to blow his stack, which accounts for his codename. Specialized Education includes Artillery School, Engineer School and Advanced Infantry Training. Qualified Expert: M14 rifle, M16 rifle, M1911A1 pistol, M79 grenade launcher, M2 mortar, and M1 mortar. This is another Dollar General figure, so as with Snake-Eyes, there's no actual filecard for us to quote, so we've gone back to Generation 1 to grab some text. But that biography up there isn't actually from Duke's filecard - it's from Short-Fuze's, as you can probably tell. See, Duke never actually wore a green uniform like this, so unless the figure is a retro throwback reference to the long-ago year of 2008, then there's no precedence for it. But a guy with no distinguishing characteristics wearing the plain green uniform? That was all the rage back in 1982! 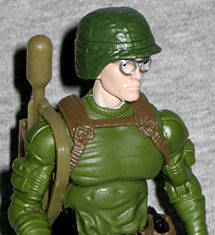 In the comics, Short-Fuze wore glasses that this head obviously doesn't have - it's the POC Dusty head, after all - but the original toy didn't have those, either: they didn't actually show up on a toy until 2005, and have only been seen on two of the figures he's ever had. The blonde hair is right on the mark, however. And making glasses is easy! The body is assembled from reused pieces, of course. The upper body of 25th Anniversary Snake-Eyes, the thighs of Zap, and for some reason, Clutch's boots. Why those? The holster on the right boot just looks out of place on a guy who isn't driving. But then, 1982 Clutch and 1982 Short-Fuze had the same legs, so it kind of makes sense, doesn't it? The harness on his chest is what really made us think of Short-Fuze instead of (fellow '82 greenshirt) Grunt: Grunt had suspenders, while Shorty had these sort of armpit loops. If there's one thing that might prevent this from being Short-Fuze, it's the helmet: the original had one of those "moveable visor" Joe helmets, while this is just a green version of the helmet that Dusty had. At least you know it'll fit perfectly on the head! 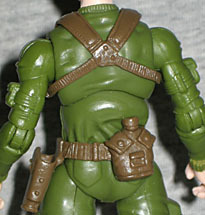 His belt has a holster on the left hip and a canteen on the back - this piece originally came with Zap. He's also armed with an M-16 and a black pistol that's the wrong size to fit in either the hip or boot holster. And with only one pistol, one of those holsters will have to be empty at any given time. There's nothing at all about the toy that says Duke (other than the packaging, which literally says "Duke" - twice) and we know Hasbro's designers have a great eye for old details, so if it looks like Short-Fuze rather than Duke, why should we pay attention to the name on the card? With the addition of a few key accessories, this is the Short-Fuze of my collection; when you buy him, you can make him into whatever you want.